You might think that you might need to hang up your climbing shoes as late October/ early November rolls around—not the case. 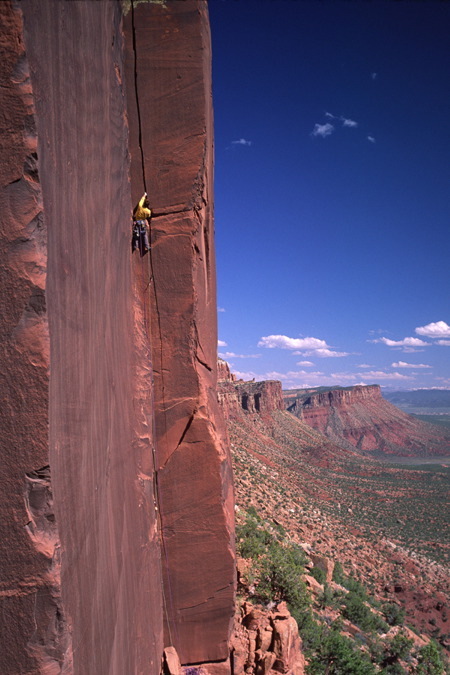 Rock climbing in the San Juan’s is winding down about this time of year, but it is only just beginning in the desert to the west. The climbing is world class and has everything from four-pitch splitter Wingate climbs to single pitch sport routes, bouldering and everything in between. There are now something close to 600 routes west of Telluride. 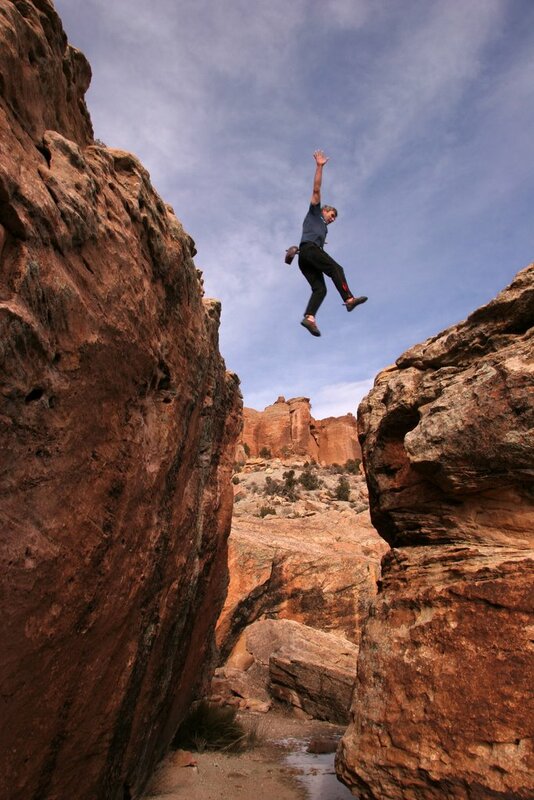 Red Rocks (not the one outside Las Vegas) is my favorite sport area (right now). 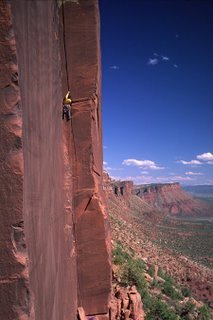 Areas such as Carpenter Ridge are sporting 350+ foot crack routes—all trad (see photo of me on Cowboy Up—photo by Charlie Fowler). This was the first route to go up on this wall. The first pitch (the one in the photo) is 5.10+ and demands your attention for 140 feet. The second pitch (a mostly .5 Camalot-wide finger for me) is 5.12- (120 feet high) and the last pitch, a killer splitter that heads through a overhang (5.11+, 90 feet). This is truly an amazing climb. Also available in this region are many bouldering areas (see photo of Charlie Fowler making the jump between boulders). Late Oct, Nov., Dec, Jan, Feb, March through early April (and select days in the summer), these areas are prime for climbing on rock. Just make sure to bring lots of water and sunscreen. It is possible to find routes of all grades at most areas though some areas lend them selves to providing more of one general grade (easy, moderate and/or hard) than others.